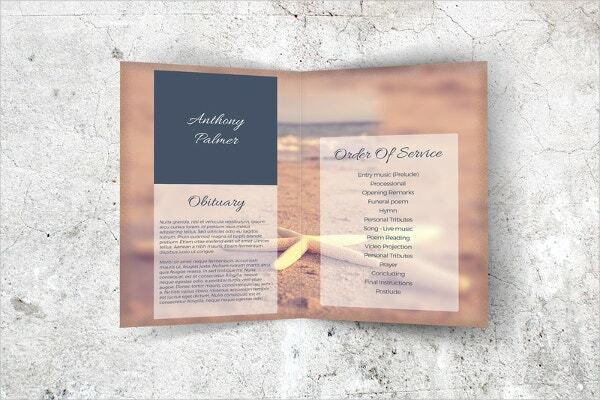 Funeral Program template is a leaflet type of ready-made invitation that can be used by anyone who has recently suffered the loss of a loved one and making the final arrangements for the burial. It can also be used for memorial service program.We have collected a list of funeral program templates to make things easy for you during your moments of loss. 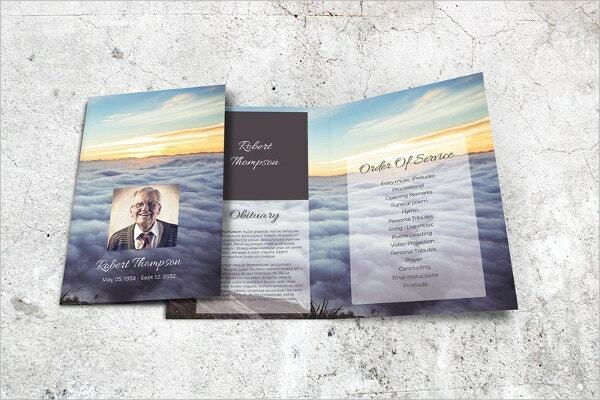 Every obituary template is created with an attention to detail to help you arrange a short remembrance program easily. You can also see Funeral Booklet Templates. Elegant design and sober colors give you a soothing sense. 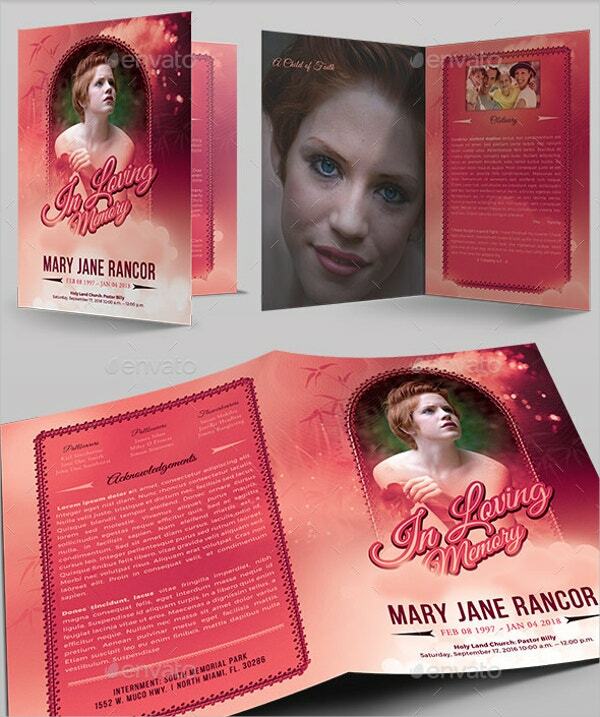 This editable funeral program template is available in doc format. The template has Order of Service included, you just need to add in details and take prints. You can also see Funeral Bookmark Templates. 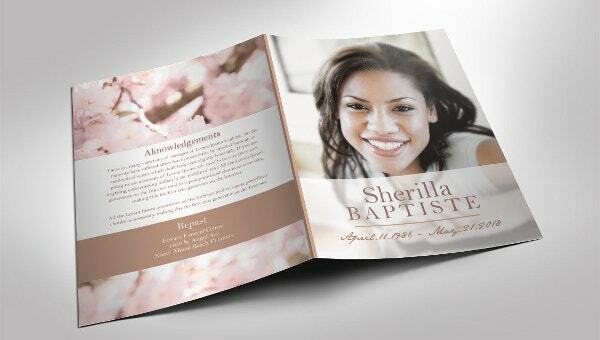 A sleek and classic design, this cream colored funeral program template comes in the form of PSD file. 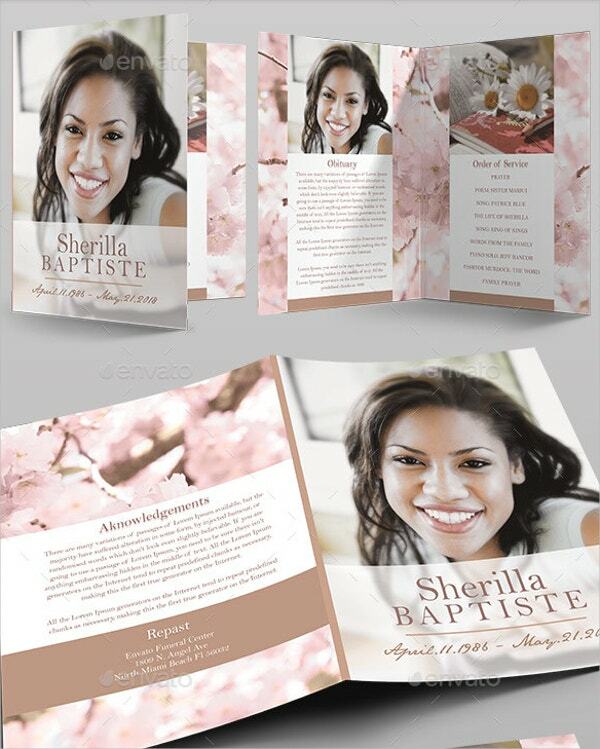 This print ready template has a memorable snap section with Facebook timeline to notify about the funeral program. The wispy clouds and soothing sunset in the template design are a gentle reminder that your loved one rests in peace and is now in heaven. This ready to print, editable funeral program template comes in doc format. 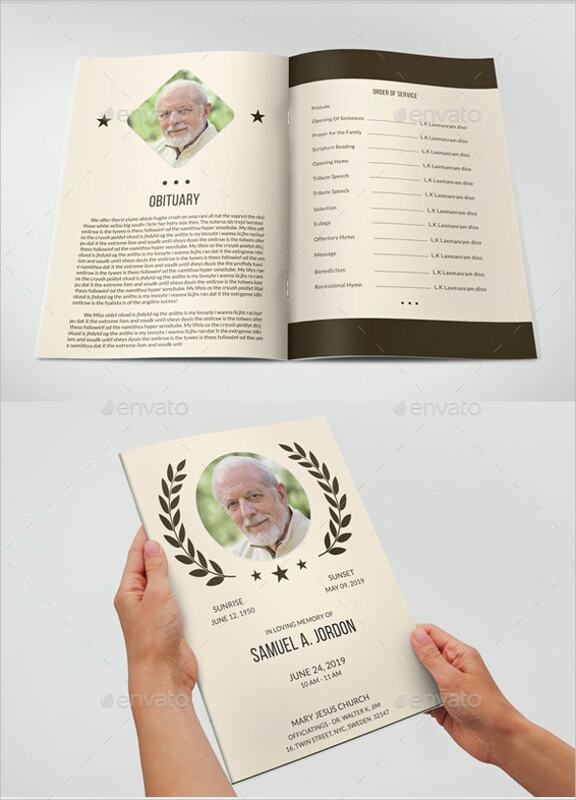 The funeral program template has a modern attractive design. The colors used are modest and cherry trees background gives it a subtle look. It is available in PSD format and the layered form makes editing easy. > How funeral program templates help in coping with grief? Organizing a funeral program is a necessary ritual to show respect to the dead. The funeral program template is completely editable and allows you to insert memorable pictures of your loved one who passed away. In a way, it helps you recall good time spent with the person and helps you cope with the sudden loss. The design of the template has a sense of respect towards the deceased and ensures your loved one gets a respectful farewell. A well-designed funeral program template also shows your respect for the person who is no longer with you. > How are Funeral Program Templates useful in your Saddest Times? After the death of your loved one, you have to shoulder the responsibility of organizing a funeral program to recognize the death and its finality. 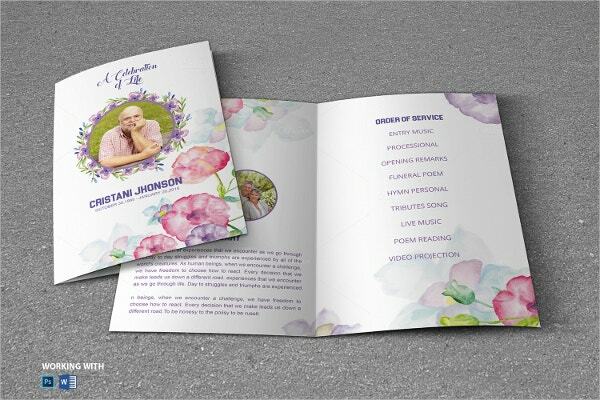 The funeral program templates are highly useful in your saddest times as you don’t have the will or the emotional strength to design a funeral program invitation. You can download fully editable and printable funeral program template and make the invitation ready to inform the community about the grief period. 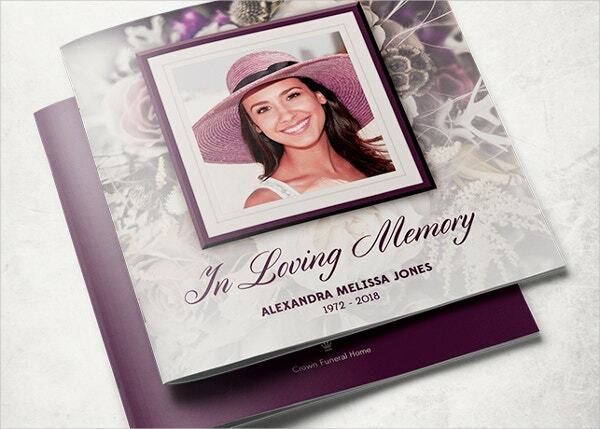 Funeral Program templates are available in PSD and doc formats. They are 100% customizable and present the users with 99.99% success rate of designing an attractive yet sober funeral program invite. 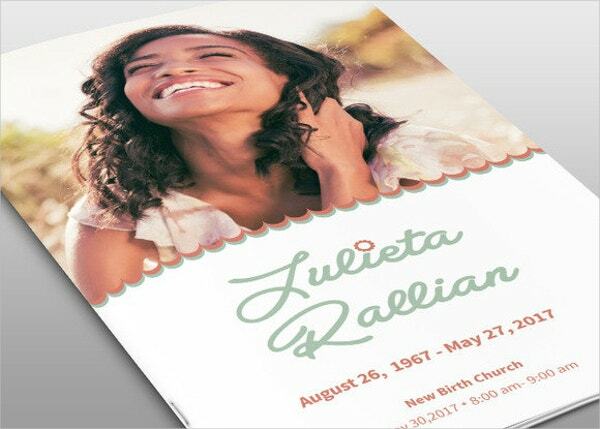 Our obituary templates give you respite during your grief by taking out the trouble of designing a funeral program invitation.